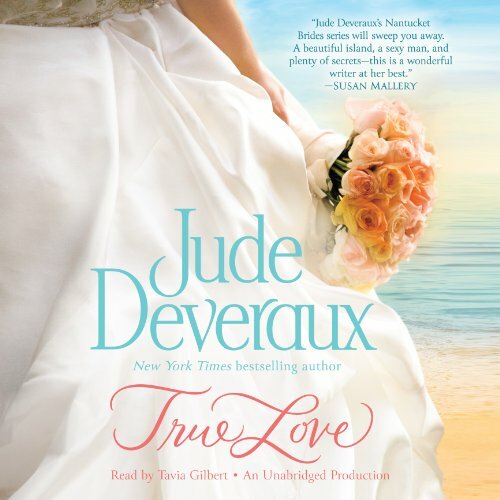 Jude Deveraux, the New York Times best-selling author of unforgettable romance, returns with a breathtaking first book in a fantastic new series: the Nantucket Brides trilogy. Set on the magical Massachusetts island, True Love introduces characters from a new generation of Montgomery-Taggerts, the beloved family from Deveraux's classic novels. Just as Alix Madsen is finishing up architectural school, Adelaide Kingsley dies and wills her, for one year, the use of a charming 19th-century Nantucket house. The elderly woman's relationship to the Madsen family is a mystery to the spirited Alix - fresh from a romantic breakup - but for reasons of her own, Alix accepts the quirky bequest, in part because it gives her time to plan her best friend's storybook wedding. But unseen forces move behind the scenes, creaking Kingsley House's ancient floorboards. It seems that Adelaide Kingsley had a rather specific task for Alix: to solve the strange disappearance of one of the Kingsley women, Valentina, more than 200 years ago. If that wasn't troubling enough, Alix must deal with the arrogant (and extremely good-looking) architect Jared Montgomery, who is living in the property's guesthouse. Unbeknown to Alix, Jared has been charged with looking after her while she lives on the island - an easy task for him, considering the undeniable chemistry between the two. But Jared harbors secrets of his own, which, if revealed, may drive a wedge between the pair. With a glorious Nantucket wedding on the horizon, sparks fly, and the ghosts of the past begin to reveal themselves - some of them literally. Finding their lives inextricably entwined with the turbulent fortunes of their ancestors, Alix and Jared discover that only by righting the wrongs of the past can they hope to be together. If you could sum up True Love in three words, what would they be? What was one of the most memorable moments of True Love? The baby diaper changing scene. Its not one I will forget though it wasn't the most romantic. Most memorable scene that is among my favorites would probably be when Alix is talking about what it was like to grow up with her mother and describing her fifth birthday party and how her mom brought a horse into their New York apartment. How she gets out of trouble for that is just so much fun! Tavia Gilbert is probably one of my favorite voice actresses for audiobooks. There are many series I've acquired just because she read them. I was very excited to see they got her for True Love. She has a way of making the story come to life in a way few others can. She's fantastic with both men and women's voices and I can always tell who she's speaking for before she ever says "Such and such said." This holds true for True Love as well. Sometimes you're on the road to destiny without ever even realizing it. I was beyond excited to see that Jude Deveraux was going back to the Taggarts and Montgomerys. I grew up on her books and was simply thrilled to see the Montgomery name. And now there's a new family name to add to these tried and true favorites, Kingsley. While this story isn't listed under paranormal, I think it has very strong paranormal elements with the ghost that haunts the Kingsley House and the mystery that involves past ancestors reborn to the current family. Jude really brings Nantucket to life in this book. You can tell she must have lived their for a time to know all she knew. You feel you're given a slice of what Nantucket is like for those who stay year round and what they think of "Off Islanders." We're introduced to some fantastic characters who bring this world to life. I don't want to say too much and give spoilers, but I cannot wait for the next installment of this trilogy and am actually hoping some of the characters take over and we get a whole series out of Nantucket Brides. Every character has depth and secrets. With every page, you're left wanting to know more about them. Not just the main characters but all. I loved the manipulation the family ghost provides and then when our heroine's mother arrives, I couldn't stop laughing. Would you try another book from Jude Deveraux and/or Tavia Gilbert? I absolutely love Jude Deveraux's "A Knight in Shining Armor" and quiet enjoyed Tavia's narration of "Scream for Me" so I had high hopes for this pick. What was most disappointing about Jude Deveraux’s story? I didn't believe the chemistry between the main characters was there, and if you don't have that in a romance book, the story's pointless. Yes, I'll give Tavia another try because I've heard her do much better. I don't understand why she used the voices she did. If they were suppose to "fit" the setting or the characters she missed the mark on both accounts. What character would you cut from True Love? At least half the background characters didn't add or help move the story forward. All they did was pad the plot and make the 14+ hours seem unending. I enjoyed the story, everybody in the story begged to be in the next book. I will read the next book and the next. The story gets 5 stars, the narrating gets 1, (I would give a zero if I could because I couldn't even listen to her) making the overall score 2 stars. This is a great story but I couldn't listen to this audible book past the 3rd chapter. I had to read it on my Kindle. The narrator, Tavia Gilbert, was so annoying I couldn't stand listening to her. It sounded like she was yelling and near hysteria all the time. I wish I would have listened to a sample before wasting my money! I think the performance really affected my appreciation of this book. There is something very annoying about the over-enunciation. I never felt a real connection to the main characters...they didn't seem particularly deep. The heroine is a little girl and the hero is annoyingly arrogant with no redeeming features. Sometimes I wish Jude would stop over-plotting and work on character development a little more. I miss her strong, independent, sassy female characters. I miss the humor. I always love Jude's books, audio or printed. In this case, I am sorry I wasted my money on the audio version. The reader, Tavia Gilbert, is NOT a good match for this book at all. Every word seems forced or exaggerated. She tries too hard. So I cannot recommend the audio version of this book. Please do not have her read the next 2 books! If you’ve listened to books by Jude Deveraux before, how does this one compare? Different reader. Gabra Zackman or Lorelei King. What did you love best about True Love? I enjoyed this ghost story, it's very different from what I've been reading. I had no problems with the narrator. The entire story was perfect. I will recommend this book to all my friends. Looking forward to the next!! This was another great book by Jude Deveraux. I can't wait for the next one. Read book 2 before I knew there was a book 1. Enjoyed both and can't wait for the final book.